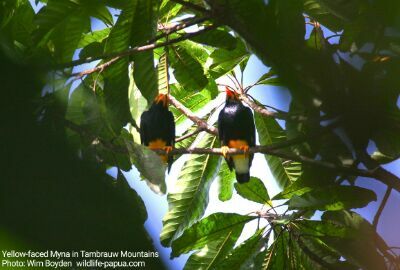 There are a lot of species of birds in rainforest of West Papua. One of them is Yellow-faced Myna (Mino dumontii). The bird likes to sit on tree tops or naked dry branches of a tree in forest. They can easily be watched around the forest edges such as clearing areas of villages and riversides. I often see the birds when I run birding tours in lowland forest of Manokwari, in ridge forest of Sorong and along the Syugrar forest of Tambrauw mountains. Yellow-faced Myna flies alone, in a couple. In a rare cases, they maybe seen flying in groups of 3 to 5 birds or even more. Their physical characteristics of yellow face, black feather both on the wings and body, and white rump. These beautiful birds eat fruits and insects. They spend most of their time in the canopy of the forest especially on the branches or twigs of tall trees. Because they dwell in high trees, visitors need powerful birding binoculars to watch them. I usually use my Visionking 10×42 mm binoculars that have got Bak4 prism and multi-coated glass lenses. Birders from Europe usually bring Swarovski EL 8,5×42 or Swarovski 10×42 mm binoculars. When sitting at the branch of a tree, usually, Yellow-faced Myna can stay for 1 or 2 minutes before flying again to find fruits. The mating season is April. During this time, male birds stay in one tree longer time and continue to call their female counterparts. When female birds come they male began to chase them, hopping from one branch to another. It is a good scene to watch and take pictures of them.